Both Offers 1 and 2! Downloadable Course Audio MP3: 3 hours & 47 minutes. Recorded live with a group of participants on March 25, 2017. Catapulting = Quantum. All over the place = Quantum. Super mega fast = Quantum. Huge reality adjustments = Quantum. Bizarre = Quantum. Rapid Release = Quantum. Challenging = Quantum. Magical = Quantum. Everything = Quantum, we just don’t realize it in the beginning. When we first start to awaken, it’s as a human, where our soul/spirit has awoken inside of our body (but we don’t fully understand this yet) and opening up to a higher (self) existence begins too. As we embrace our Spirit/Soul journey of higher consciousness expansion, we awaken as multi-dimensionals too. Embodiment is an evolution and continual transition phases from carbon-based human to Universal/Cosmic higher selves spanning galaxies and beyond, while transcending all things human-ego-aspect within ourselves. Our fixed-reality-linear programmed human aspect does not do well with Quantum, for realities are not fixed. Time/lines/realities collapse and realities start to shift. Inside and outside, as both are the same. As we anchor light inside of us our template that held time completely changes. The higher we vibrate overall, the less time exists until it completely collapses into an ENERGETIC FIELD/SPACE where we function from Zero Point, across dimensions & timelines as a Quantum Light Being, instead of linearly like before. We find ourselves in a vibrational existence that is no longer bound by human separation of time. Every reality that collapses is unifying for us, so that we can move into a higher vibrational conscious reality faster, yet our human aspect is not always aware of this. A collapse of timelines (realities) opens portals to other/alternate realities, new opportunities and moves us further into that which is more aligned with our Soul’s purposes and Galactic missions here. As humans, we don’t have access to how all of this works. Understanding how to maneuver, navigate, identify and shift easily, minimizes those abrupt awakenings/landings, those realities that have to shock us awake, keep the physical from going haywire while we just try to hold on, as we have to choose to quickly let go to not be drug down with it…..
Earth went Super Quantum and so did we. Being unaware of this will keep one in a confused and chaotic state. This is a process of understanding, applying new tools to a Quantum Existence and our ability to jump from realities/timelines easier, without the harshness of unconscious collapse because we didn’t want to listen, see, know and do. This Light Encoded information is to assist with understanding processes and how to maneuver with greater ease. Navigating the “Universal Obstacle Course” as well as the “ping-pong effect” (my words) of Quantum Realities is Mastery within itself. We discuss how to recognize old timelines to intentionally collapse in order to move into new ones faster for you too! In this inner-active 2 hour (3 if we go over, as usual) Quantum Discussion, Lisa will provide you with clear tools to utilize and implement in order to further open your own inner channels to higher dimensional/higher vibrational knowledge and realities for you to anchor in your physical reality here. So, bring yourself, your readiness and we shall rock it out as love! How exciting! More for everyone! WE LOVE this! So much fun! See you there! Awesome! I have been listening to Lisa’s information for over a year. I wonder if this course would give me any more additional information. The answer was YES!! If you have never listened to Lisa or are a long time follower of her work, this course is going to Quantum push you to the next level! Buy it!!! Thank you Lisa! This call was fabulous! Loved being able to hear everyone’s questions and she sharing. Some of the questions asked were ones I had over the past few years but had forgotten about. Lol! I am excited for the next adventure you take us into. Thank you so much for doing all you do to help us understand. Thank you for amazing guidance in such super key subject! This course clarified the concepts of timeline jumping and collapse with crystal clear clarity. As a matter of fact Just after the course I experienced having awareness of timeline jumping. I take care of my orchids so they keep reblooming. I looked at couple of vases and thought to myself that it would be so nice of they bloomed soon. Literally only few days later I was very surprised when I saw that both cases had grown flower buds… I jumped timelines and it was clear by the physical evidence of the orchid blooms, and apparent changes in the quality of what was happening in my life. I highly recommend this course and any of Lisa’s courses. I’ve been working with her for couple of years now and can attest that her guidance does help me grow, quantum style, in my awakening and Ascension journey! Mahalo Nui Loa! Intense! This course was so intense I could barely keep up with the info, but the cool thing was I didn’t need to. The realizations I had after the course keep flowing and I didn’t have to do anything other than be present as much as possible every day as I went about my day. Another amazing class by Lisa! To be able to finally understand timeline jumping! Like always Lisa is helpful and giving in the sheer number of information that she shares. With everything that is happening in life right now, it is a very important class , teaching how to get there, where we want to be. Wonderful! This course provided many answers and much needed guidance. I feel more expanded, present, and more aligned with my high heart space, and soul. I feel more confident to navigate timelines, and I am excited about more awesome adventures. Thank you Lisa! An Excellent, Must-Take Course! Lisa does an amazing job explaining how quantum timeline jumping and collapse works. Her words are direct and to the point, cutting through the fog and bringing clarity. You feel every word and every thought coming directly from her heart. I highly recommend this course to everyone, no matter where on your journey you may be. Empowering! Wow what an amazing course!! I learned so much and my life has changed so much already just after a couple of days! So many lingering questions have been answered, and I understand the “why” of so many things much more now. Very empowering course! Thank you!! Physical REALities are a combination of all things ENERGY. This is an alchemical process. Physical matter takes form as a vibrational response, and as a result, of our own consciousness / unconsciousness. This course is focused on simplified understandings on how to access these natural gifts and further becoming a pure alchemist again. Quantum is how we catapult, collapse timelines intentionally and continually creating all new realities in alignment with our highest soul’s purposes here. As humans we look at the outside world and can’t believe that WE CREATED THAT. Well WE did, everyone of us, and the “answers” are held within our cellular memory and human and higher consciousness DNA. As WE realize (real-eyes) this, we take our power back, we see what is ours, what is others, what is collective, what is true, what is not true, we start to see in illusions, holograms, feeling the vibrations of discord (unconscious programs) and when there is much to be cleared on a cellular level, it can become overwhelming, which is a sign to show us where we need to place our attention. When our physical reality is out of alignment, then there’s something inside of us that needs attention, some where we need to re-focus, shift and tune to a higher vibrational reality/plane of existence to transcend and resolve all back into love from within. Love is not what we thought it was. It’s the opposite and requires an entire mentality shift. Realities are energetic first, vibrational first, represent mindsets, beliefs, limited or expanded, love or lack, empowered from within or dis-empowered due to an old cellular memory program. This is a process of understanding, applying new tools to a Quantum Existence and our ability to jump from realities/timelines easier, without the harshness of unconscious collapse because we didn’t want to listen, see, know. Come to understand the processes and how to maneuver with greater ease, how to identify what’s going on to intentionally collapse old timelines to move into new ones faster for you too! 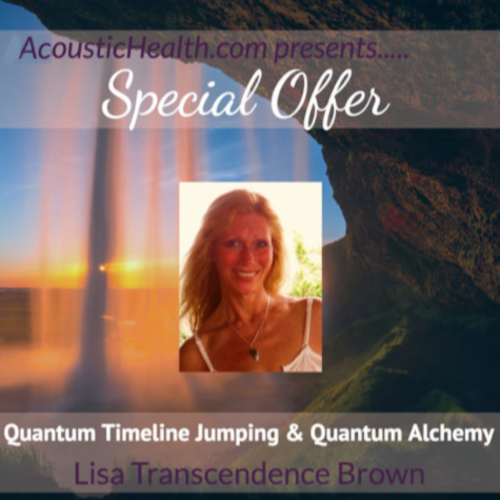 **In order to gain access the Understanding Quantum Energetics & Alchemy Program/Course included in your Special Offer Purchase, you will need to complete separate Course Registration through Lisa’s Mastery School. This will be provided to you upon reciept of purchase.